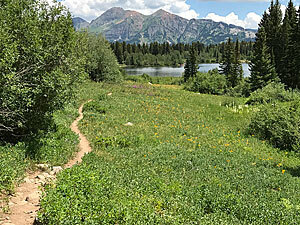 Colorado officials hope the COTREX web map will make it easier for Coloradans and visitors to the state find wonderful places to hike such as on this serene trail near Crested Butte. Every day, Colorado's vast network of wilderness and urban trails beckons hikers, cyclists, horseback riders, runners, and all-terrain vehicle (ATV) riders: come outside and enjoy an adventure. 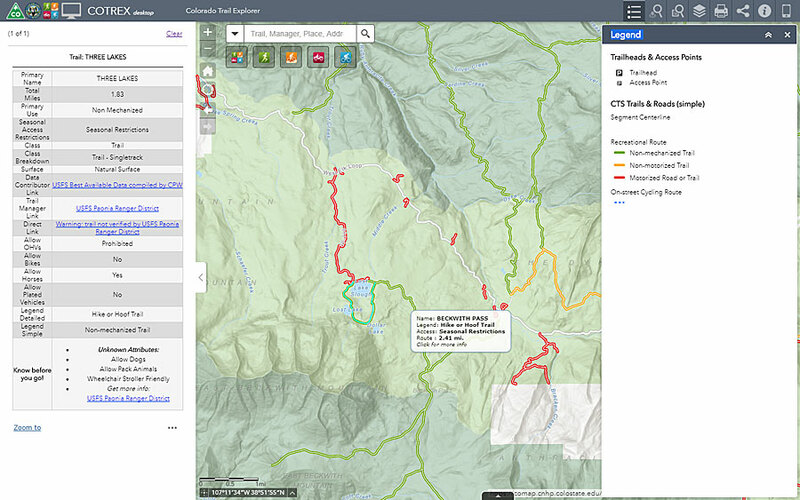 To point Colorado residents and visitors to the trails appropriate for the type of recreational activities they are interested in pursuing, Colorado Parks & Wildlife (CPW) created the new Colorado Trail Explorer (COTREX). 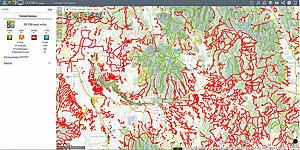 The web app, developed using Web AppBuilder for ArcGIS (Developer Edition), was built to support Colorado governor John Hickenlooper’s Colorado the Beautiful initiative, a plan that's meant to ensure that within a generation, every Colorado resident will live within 10 minutes of a park, trail, or green space. 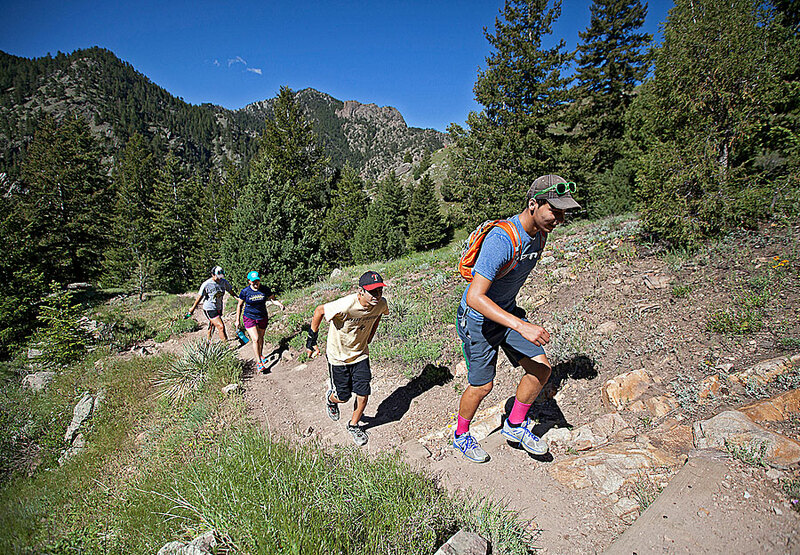 "The Colorado Trail Explorer builds on our Colorado the Beautiful initiative by giving people quick and easy access to recreational opportunities and more readily connects people with the outdoors," Hickenlooper said in a press release. 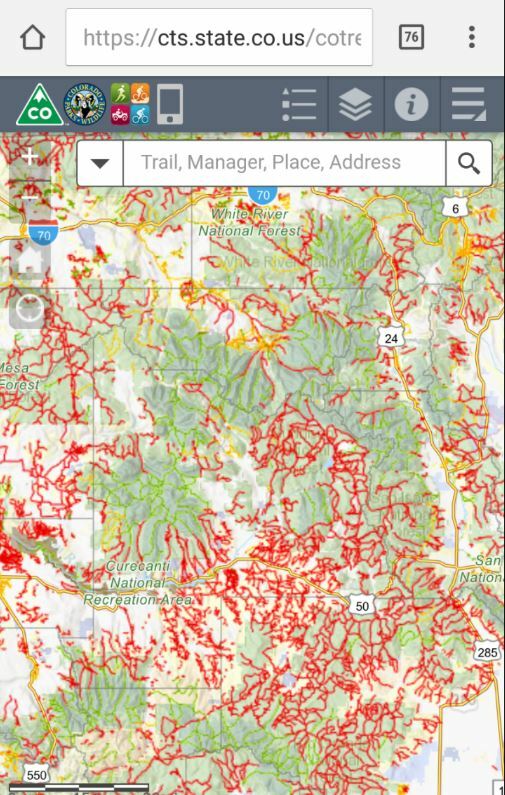 "Consolidating trail information that traditionally exists in dozens or hundreds of places into a single application makes it easier for Coloradans to find the trail options that might be just beyond their back door or near a favorite destination." 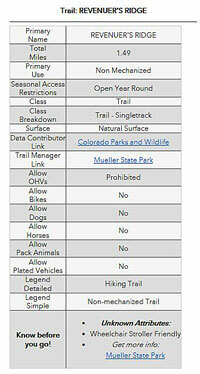 The COTREX web app includes noteworthy details about each trail such as whether dogs or pack animals are allowed. Eighty-one contributors, including the United States Forest Service; the National Park Service; and cities such as Lakewood, Fort Collins, and Denver provided data on more than 39,000 miles of roads and trails for COTREX, which has both desktop and mobile-friendly versions. 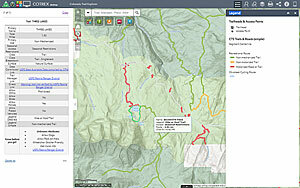 "This is an amazing tool," said Lauren Truitt, CPW's public information and website manager. "There are plenty of map books out there, [but] this is the first in digital form and very accessible to everybody." While Coloradans live in what Truitt described as "an outdoorsy state" that brims with lakes, streams, mountain trails, and bike paths and lanes, residents may need a nudge to get out into nature. Some people let technology gobble up most of their free time, or they are unaware of the vast networks of trails or cycling routes within a short distance of their homes. COTREX is color coded. For example, multi-use trails are colored orange while biking trails are colored blue. "Technology has inundated our life," Truitt said. "How can we use technology in a positive way to connect people to the outdoors?" Truitt hopes the answer lies with COTREX, a web map with a set of interactive tools that people can use to search for and find the perfect trail or route that suits their activity of choice. About 17,000 trails have been mapped throughout the Centennial State, including West Grouse Creek, which is designated for hikers and horseback riders only; Two Elk, which allows bikes and horses; and Wagon Gulch, which is open to motorized vehicles, horses, pack animals, and bikes. 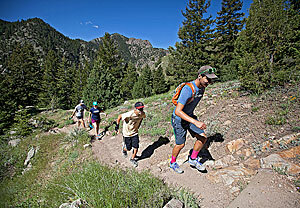 A group of hikers traverse a trail in Colorado’s backcountry. Photo courtesy of Colorado Parks and Wildlife. The web map specifies if the trails allow horses. Photo courtesy of the Bureau of Land Management. The digital map is intuitive to use. When you click the green, orange, red, or blue buttons on the toolbar, the map will display a corresponding color-coded network of trails and roads—nonmechanized-vehicle trails in green, multiuse trails in orange, motorized trails/roads in red, and cycling routes in blue. When you click a specific trail, a box that contains useful information will appear to the left of the map. 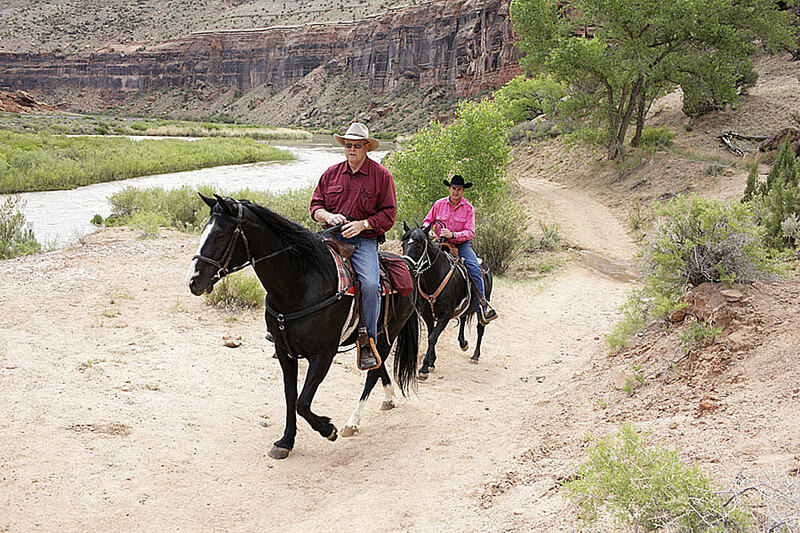 This includes the name and length of the trail/road, the trail manager (e.g., Bureau of Land Management), and a link to the organization's website, as well whether horses, pack animals, bikes, and off-highway vehicles (OHVs) are allowed and whether the trail is wheelchair accessible. To search for the trails around a specific location—whether it's your home, a place of business, or a hotel where you are staying—just type its address into a Search box or place a pin on the map. The app will populate the map with nearby trails, generating a list of those trails by name and information such as the length of each trail in miles. COTREX includes an allowed use highlighter, which means if you click, for example, on “allow bikes,” all the trails that permit bikes will be highlighted in yellow on the map. Typing an address in the COTREX web map’s search bar and then clicking on “List Trails Near” will return a list of trails from within 1 to 25 miles. Say you stop to get a drink at a coffee shop near the intersection of West Elizabeth Street and City Park Avenue in Fort Collins. You have your computer with you and decide that you want to go for a hike in a couple of hours. Starting the COTREX app on your computer, you go to the List Trails Near tool and type the address of the coffee shop into a Search box—a map appears that displays all the trails and cycling routes within a radius of 25 miles. You could also narrow the search to a 2-mile radius and find choices like Mason Trail (1.47 miles away) and West Spring Creek Trail (1 mile away). A list of all the trails by name and the length of each and its primary use (nonmotorized-vehicle trail) will also appear on the right side of the map. If you click a segment of the trail on the map, a more detailed, "Know before you go" description of the trail—including information such as whether dogs or bikes are allowed—will appear to the left of the map. CPW received a Special Achievement in GIS Award for the creation of COTREX at the Esri User Conference in July 2017. Web AppBuilder for ArcGIS (Developer Edition) was used in the development of the app, giving its builders the ability to use standard widgets provided by Esri, as well as customized widgets from users collaborating on GeoNet. There’s also a browser-based mobile version of COTREX. Some of the widgets were tweaked to create the handy Allowed Use Highlighter on the toolbar. The use list includes Allow Bikes, Allow Horses, Allow Pack Animals, and Allow OHVs. If you click Allow Bikes, you will see all the trails, highlighted in yellow, within your map extent that allow bicycles. The names of the trails and the field manager offices are listed to the right of the map too. When you click the name of one of the trails in the list, the map zooms in to that trail. There's another plus: the app is both desktop and mobile device friendly. The desktop version contains a full complement of tools, while the browser-based mobile version contains a map with the color-coded trails, pop-ups that display the name of the trails you click, a Search box, and a few basic tools. The app was customized to a great extent. Data from Colorado government agencies and nonprofit organizations was mashed up with Esri data to create the basemap. This was made possible by Esri's allowing customization of Esri vector tile basemaps. 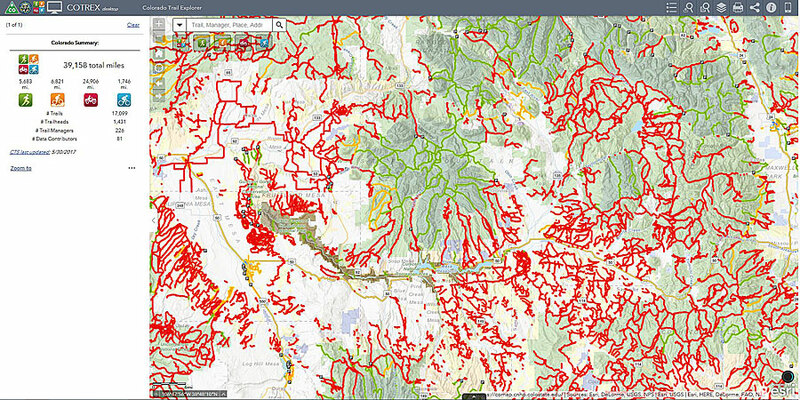 It includes data from the Esri World Hillshade basemap, protected-lands parcel data from COMaP, and roads and trails from Esri vector tile basemaps. To learn more, watch this helpful video tutorial on how to use COTREX.